Golden Gate Bridge photos are everywhere. But -- how do people get that perfect shot of it? Uncover the secret to finding the perfect location in San Francisco for your Golden Gate images. There are many locations to take pictures of the Golden Gate Bridge in San Francisco. However, there are a few places out there that capture it at its best angle. At the bottom, I also posted a few of my own shots from some of these locations. That will give you an idea on what type of shot you can get from some of these places. Below, you will find recommendations for three different types of Golden Gate photos. The first is where to go to get a good full bridge shot. The second list is places to take shots a little closer up. Many of these will be partial bridge shots. The final list tells you where to go to take the best pictures at night. Not all locations are open at night, so check out this section if you want a great night shot. Coit Tower: Located in the North Beach neighborhood is Coit Tower. This is the tall skinny tower that sticks out above the city. The best place to get a shot is from the parking lot of the tower. The parking lot has short cement walls around it. Jump on top of them and you will get amazing shots this attraction as well as, Alcatraz and the entire San Francisco bay. Read the North Beach page for tips on getting up to Coit Tower. Crissy Field: Another great location for photos of it is from Crissy Field. This is the beach and grassy area on the north side of the city. You can access this through the Marina neighborhood. Take the 30 bus from Union Square or Fishermans Wharf all the way to the end of the route. Once you get off the bus, walk all the way to the water. You can pick any spot along the beach for some amazing shots. Alcatraz & Angel Islands: Both of these options take a little more work, but some of the best Golden Gate Bridge images come from these two islands. The only way to get to Alcatraz is to sign up for one of their tours. If you are just in town for a few days, the Alcatraz and San Francisco City tour has a number of stops that will allow you to get great photos. Learn more about this tour. You can also head over to Angel Island. There are a number of great spots on Angel Island to get photos of this SF attraction. In addition, you can get some amazing shots of Alcatraz Island and the city of San Francisco. Find out more about Angel Island and the other things to do while you are there. Pier at Aquatic Park: On the western side of Fishermans Wharf is Aquatic Park. This is in front of the famed Ghirardelli Square. On the west side of Aquatic Park you will find a pier that takes you out over the water. With few obstructions in your way, this is another perfect place photos. From the pier, you can also get some amazing shots of Alcatraz Island. If you prefer to get shots that are a little closer up, then check out some of these locations. Many of these are close enough that you can only get a partial shot of the bridge -- unless you have a great lens that zooms out a little further. 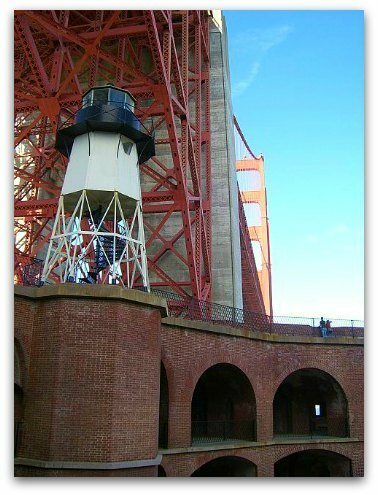 Fort Point National Historical Site: This is a hidden gem in San Francisco. This old military fort was almost torn down to make way for this Golden structure. However, the engineers took a good look at the building and realized its historical significance. They then reworked their plan it to make room to keep this landmark. The building is right under it and you can get some amazing shots from this location. The site is free, so you can walk in just to take pictures. However, I also recommend looking around a little. The best shots are from the top floor of the building. When you arrive, head to the courtyard and you will see several sets of stairs leading to the top. It's a four story building, so prepare yourself for a hike up the stairs. Take the stairs on the southern side of the building -- this way you can stop along the way and take some photos as you climb. Find out more about and how to get to the Fort Point National Historic Site. Baker Beach: All of my recommendations so far are from the eastern side. For a slightly different angle, head over to Baker Beach. This is on the western side. It takes a little more work to get over to Baker Beach, but it is worth it. 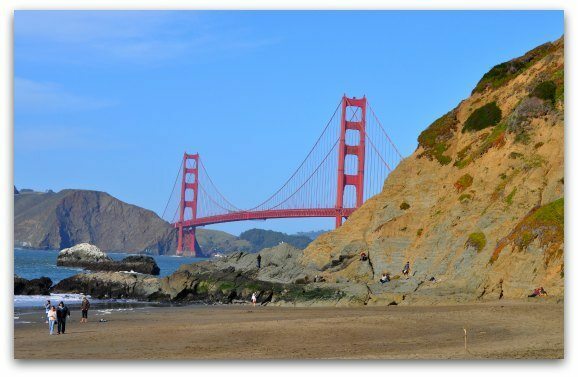 Visit the beaches page to learn more about how to get to Baker Beach for that ultimate Golden Gate Bridge photo. North and South Look Out Points: There are two 'official' areas to take Golden Gate Bridge photos. These are located on the eastern side of the bridge, on both the northern and southern ends. These are pretty crowded areas with a number of people trying to get that perfect photo. You can get a great photo from either location. Both are close to the bridge, so you can also jump into the photo for that perfect shot. On the Bridge: From either look out point, you can get onto the walkway for the bridge. This is another great way to get a close up. The walkway on the bridge is on the eastern side. You can walk the entire way across which is just over a mile and a half. From the bridge, you can also get amazing shots of the city and Alcatraz Island. If you do decide to walk the bridge, bring along a warm jacket. Due to its location, it is really windy and cool on the bridge. It is also crowded, so watch your belongings when you are taking your Golden Gate Bridge photos. Crissy Field, Baker Beach and both look out points are the best places to take Golden Gate photos at night. If you have a great camera with an expert lens, you might also be able to get a good shot from far away at Coit Tower. Fort Point is not open at night, but you can get into the parking lot for photos. You will need to walk along the water front to get there. 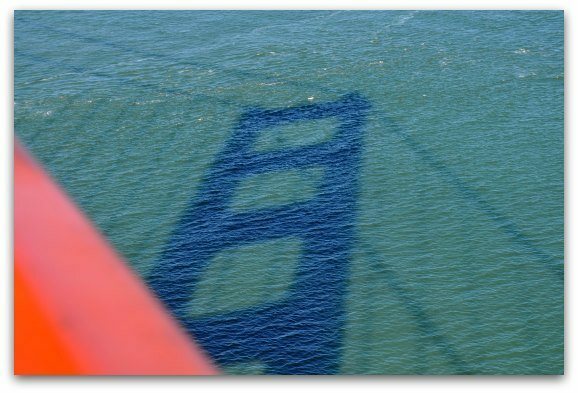 Here are some of my favorite Golden Gate photos from my years of living in San Francisco. This is one of many shots I have of the Golden Gate from the Fort Point National Historical Site. This is the view it from the top floor of the military building at Fort Point. This is from Baker Beach. I love taking photos from this side of the bridge. I took this one while on the 60-minute Golden Gate Cruise around the bay. This is another shot from that same cruise. I took this one from the walkway on the bridge. I just love looking up at this amazing structure. This is a reflection of the south tower on the water. It's not exactly a picture of the bridge, but I thought it was fun. This is a far away Golden Gate Bridge photo. Underneath, you can see the fog rolling into the bay. The fog starts to roll in most nights in the summer around 4 or 5pm. This is a great time to get some foggy Golden Gate photos. This is a view of it from the northern look out point. This is just one vantage point. You can get a number of different shots from this location. This is a slightly different shot it from Fort Point. I like this one because it shows its size in comparison to the four story Fort Point building. This was taken from the third story of the building. This shot is from Crissy Field at dusk. This was in the winter, so there was no fog rolling into the bay at this time. The area in front is the beach at Crissy Field. Do you want a slightly different shot this SF attraction? 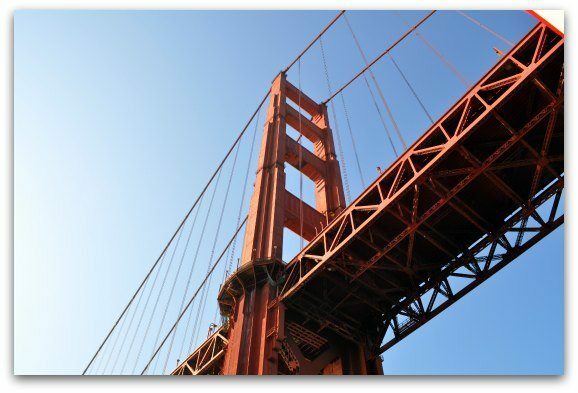 In addition to my recommendations above, check out these tours to get access to unique views of the Golden Gate Bridge. Golden Gate Bay Cruise: This one hour cruise takes you around the San Francisco bay. You will pass by Alcatraz Island and then head over to -- and drive under! -- the Golden Gate Bridge. 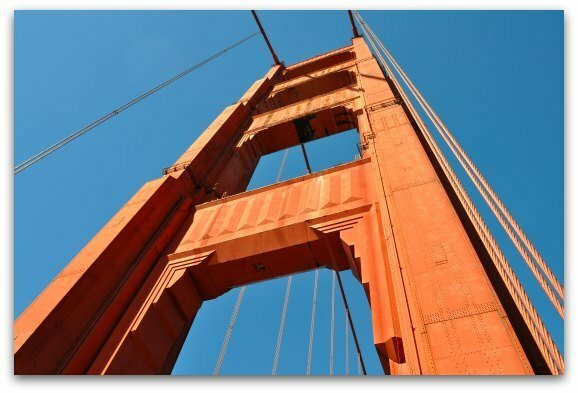 This is one of the best ways to get some amazing Golden Gate Bridge photos. 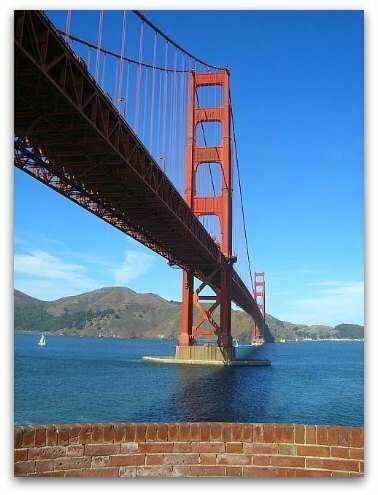 During the cruise, you will also learn a little about the history of San Francisco and its most popular attractions. 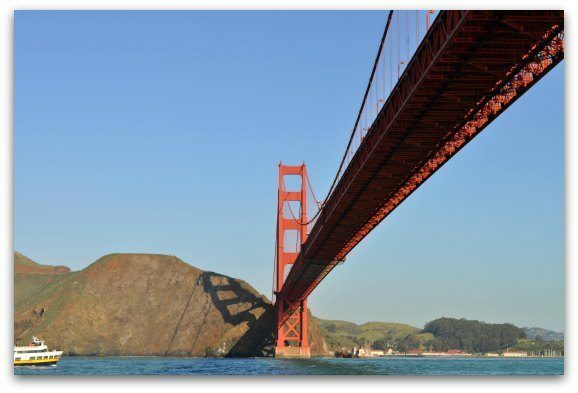 Find pricing and availability for the Golden Gate Bay Cruise. Helicopter Tours: Are you an adventurous person? How about taking a helicopter tour to get a shot from above? This will give you a spectacular and unique view of the Golden Gate Bridge from the air! Included in the Helicopter Tour is a 15 to 20 minute ride over the bay. 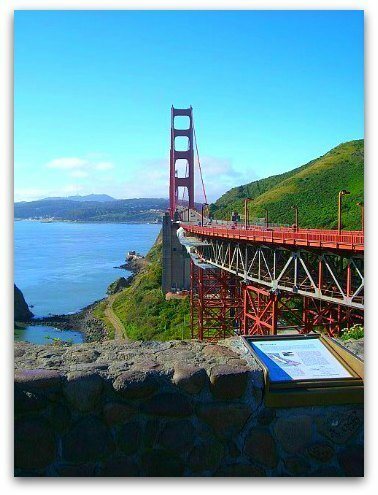 You will fly over the Golden Gate Bridge, Alcatraz and other popular attractions. You will also learn a little more about each attraction with the audio narration during your flight. Find pricing and availability for the Helicopter Tour of San Francisco. Haight Ashbury: Another great location for photography is the Haight Ashbury neighborhood. This colorful neighborhood was the scene for the "Summer of Love" in 1967. It has maintained some of its colorful past which makes it the perfect place for some additional photos. 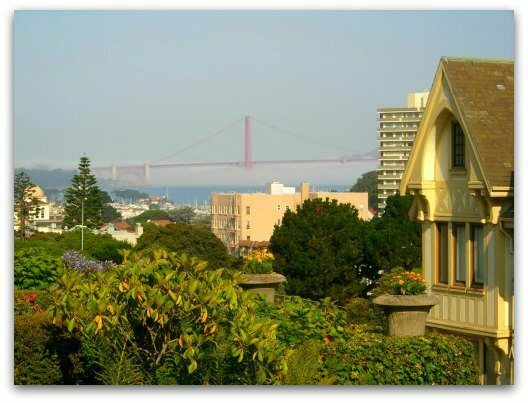 Read on to learn more about the Haight Ashbury district in San Francisco. Cable Cars: Many people photograph the cable cars, but riding one opens up even more chances for some great photos of San Francisco. Discover the different cable car lines, what you will see on each one and the best place to grab a seat for the ride.